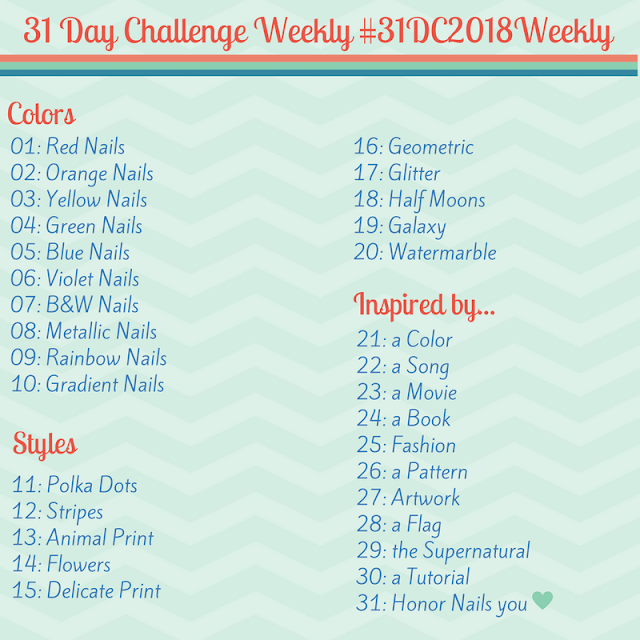 Polka Dot Nails for the #31DC2018Weekly - Polish Etc. I am finally catching up on the challenge! Apologies for being behind these past few weeks but that is the cool part of the challenge. You have plenty of time to catch up! Today, I have my manicure for Week 11, Polka Dot Nails. I used two shades from a new to me brand which I definitely enjoyed. the design is simple but can be recreated easily with any combo of colors and finishes. Let's take a look at some easy polka dot side chevron nails! I started out with a base of Dip Into Pretty "Dip into Pink" which is a medium toned hot pink with subtle silver shimmer. It was opaque in just two coats and applied smooth and easy. Once that dried, I used a small dotting tool and Dip Into Pretty "On Pointe" to create a single chevron off the side of my nail. "On Pointe" is a baby pink creme that has good coverage over the darker pink shade. Not watery at all! I topped it all off with a glossy top coat. This is quite a girly manicure with all of the pink but I still really like the two polishes together. You could do this with any combo of colors. And even different finishes. Like a matte base and metallic dots (kind of like the manicure I did last year for the same prompt). Let me know if you try this simple nail art look yourself! This is simple but it isn't boring. I love the way the dots are coming off one sidewall.